Granulomatosis with polyangiitis (Wegener’s granulomatosis; GPA) is a small-sized vessel ANCA-associated vasculitis. Dermatologic lesions may be the initial manifestations (8–13 %) or occur later during the course of the disease (12–67 % of the patients). 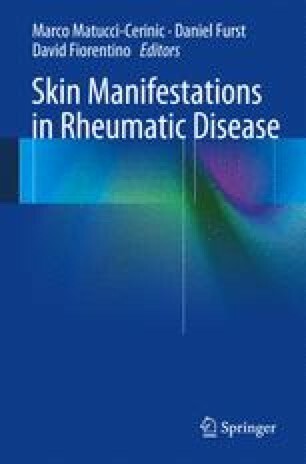 Most frequent skin manifestations include purpura, mainly on the lower limbs, sometimes necrotic, papulonecrotic lesions, subcutaneous nodules, livedo reticularis, mucosal and skin ulcerations or ulcers, and gangrene. Hypertrophic gingivitis is another rare but suggestive manifestation. On histology, purpura is usually secondary to leukocytoclastic vasculitis, whereas papulonecrotic lesions and ulcerations correspond to leukocytoclastic or granulomatous vasculitis involving small vessels or extravascular granuloma(s). Small nodules mainly reflect necrotizing vasculitis involving medium-sized arterioles of the deep dermis or hypodermis that may be suggestive of polyarteritis nodosa for the pathologist.